We are now asking people to tell us about our suggestions for updating the governing framework for community councils (the Scheme) to help residents play a greater part in the life of their community. This is the second stage of consultation. 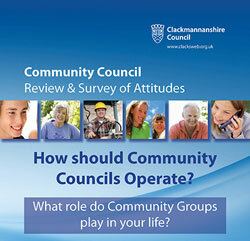 The findings will be presented to Clackmannanshire Council before the final stages begin towards the end of 2017.